I was able to visit the town of Paete just this Summer. I was amazed with the number of craft shops that are lined up on the promenade leading to the church. We went inside on one of the shops which is also a coffee shop and gallery. 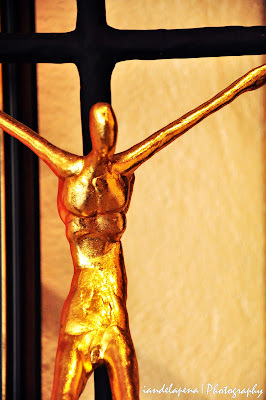 Inside the gallery I found this golden cross depicting the crucified Christ. As I look at the cross I felt like it was telling me look at me I am your God, I am grand and powerful. But I am here crucified on the cross because I love you. I've been to Paete just once, for our Humanities class. Wish I could visit it again, and see it from a new perspective! nice! real gold po ba yan?